If someone were to have shown me a picture of this rock (without the people at the top) and said, ”That’s a pretty easy climb, you could get up there”, I would have assumed they were either foolish or crazy thrill seekers. Up there! That looks like a feat only for experts or skilled mountaineers with impressive equipment. Surely I couldn’t possibly entertain the idea of scaling that? 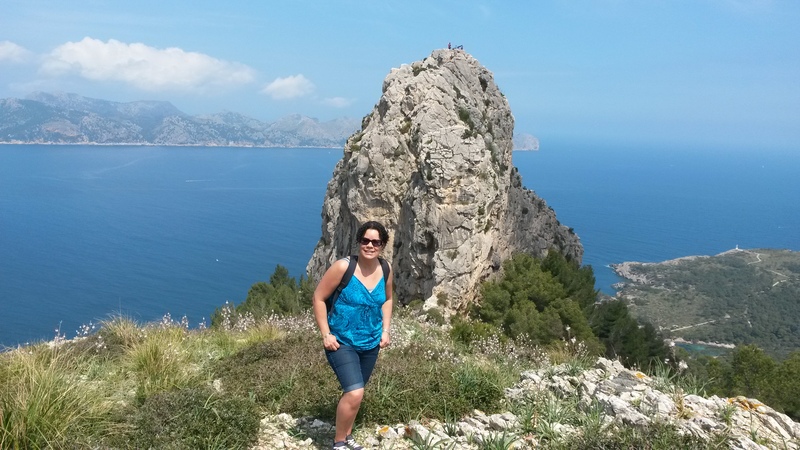 We were on a marked hiking trail in the hills of Northern Majorca. The sun blazed down, a calm breeze blew and we marvelled at the impressive views once we had reached this high point to the right of the trail. After veering off the path and clambering up some rocks, we could go no higher. But we were intrigued by the imposing rock opposite, that dominated the skyline. 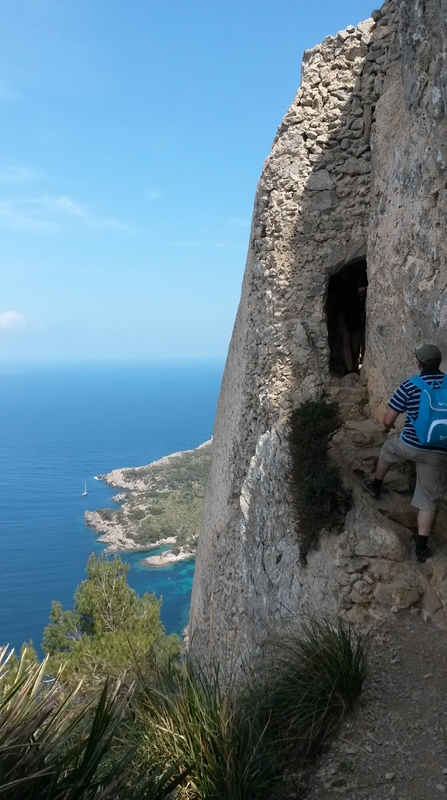 We asked some hikers along the way about the route and discovered that it was indeed possible to ascend the rock, yet we were somewhat hesitant. We weren’t even equipped with our proper hiking boots, clad only in trainers, or in my case, pumps. The start of the ascent up the rock, from a relatively easy hill climb, passes through this tunnel cut into the rock. At the other side follows an ultra narrow path, perilously close to the cliff edge. It looks frightening. But it’s all a matter of perspective. As you walk along the rock face, there’s a sturdy iron chain anchored into the edge, which you can hold onto around the most dangerous curve. When you’re certain of your safety, you don’t mind dangling your foot out for an impressive photograph. Take away the iron chain, and it would be a whole different story. Not only that, but when you see a variety of faces on their descent, from children to spritely pensioners, it reassures you that others have gone before you and accomplished the climb to the summit. If ordinary looking people without mountaineering gear can accomplish this feat, it makes you pretty certain that you’ll also be successful. If we’d only seen seasoned mountain climbers with helmets and ropes and hefty boots, I know my feelings would have been completely different. We would have undoubtedly turned back. 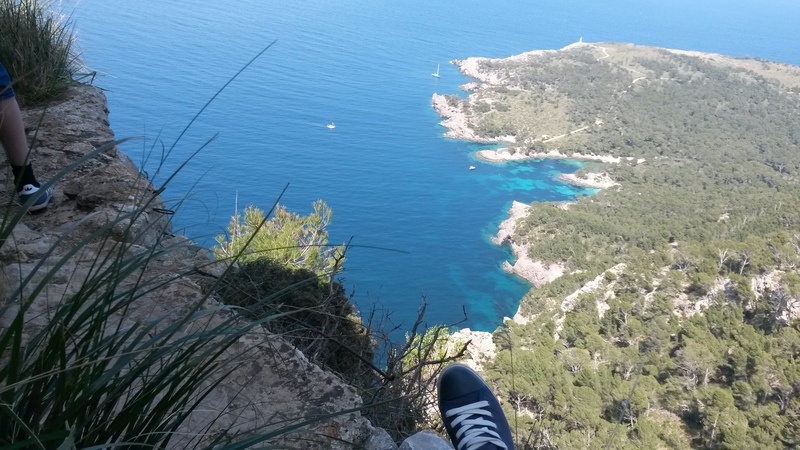 With those certainties – an iron chain and ordinary hikers – I felt inwardly confident. 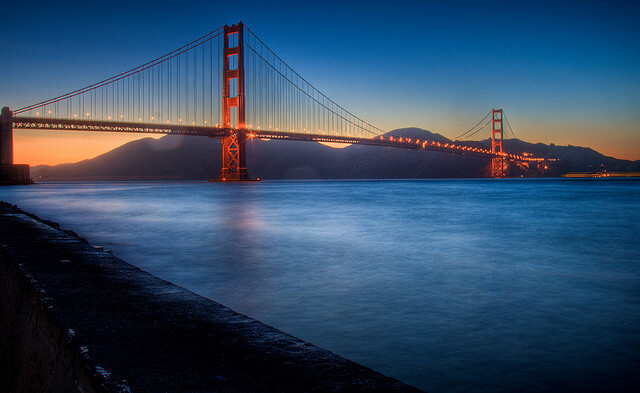 “I can do this.” “It’s not beyond my capabilities” – were my recurring thoughts. It’s all about making judgements based on evidence before you, and considering perspectives at each stage. 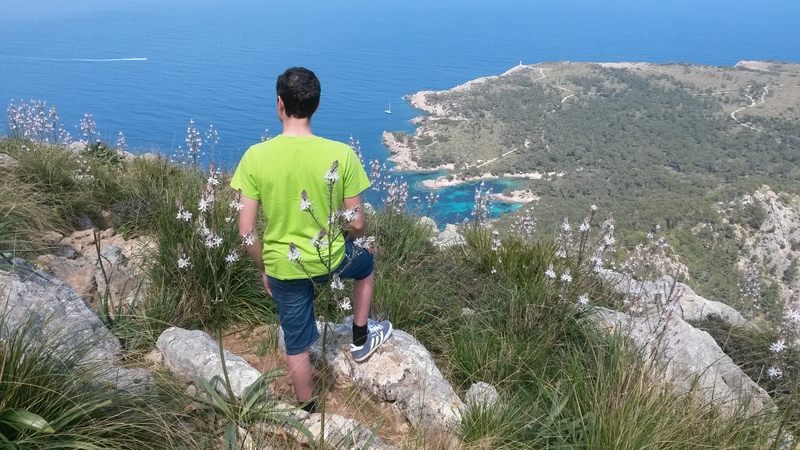 At one moment, I watched my teenage son turn sharply up and along what seemed like a dangerous short stretch, clambering over lofty rocks. It seemed highly risky from my viewpoint, but he assured me it was fine. I was reticent but then I remembered that maybe it wouldn’t be so bad as it appeared. It wasn’t. It was tricky, but it was doable for an adventurous and semi fit person like me. 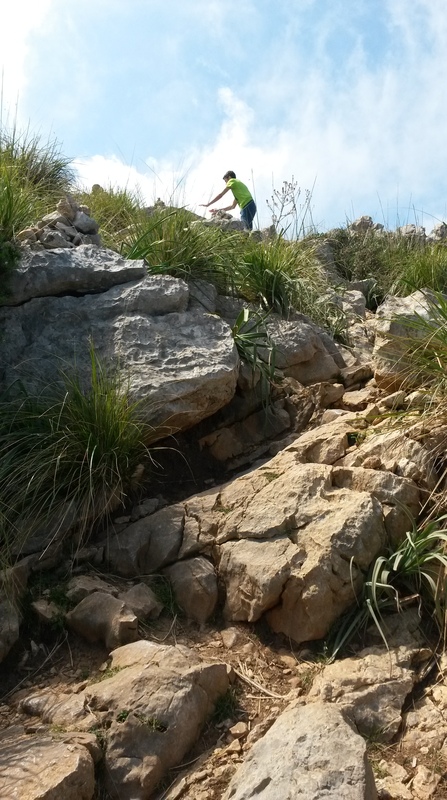 I just needed to take my time and scramble up the rocks, making sure I had a good foothold where it was slightly steep. The next part involved pressing onwards and upwards – twisting from time to time, round rocky paths and minor inclines. There was no set path; you just had to choose which way round to tackle the incline. Most people would manage this part of the climb – you just had to keep going up. The satisfaction of reaching the top was immense. 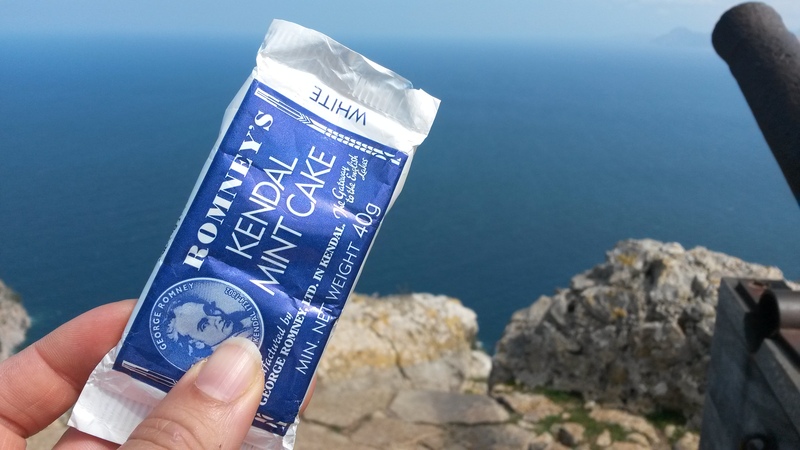 It called for a minor celebration by eating some Kendal mint cake (which I discovered had lurked in the front section of my rucksack since last summer.) From the tunnel to the top had only taken about twenty minutes, but when you think about what was conquered, it inspired a sense of achievement. Especially for an average hiker like me who tends to avoid anything too risky. If I showed you this image, you’d probably say no way. If I showed you the safety chain, the winding paths away from the edge, and the flat summit with the breathtaking views at the top, you may have a different perspective. And that’s how you conquer your fears and achieve the seemingly unachievable: listening to others, following those who’ve gone before you, and telling yourself that it’s possible. It’s amazing when you discover that something is actually surmountable or possible, simply by stepping out and having a go. We’re often capable of far more than what we attempt to achieve. Scaling this rock showed me that there are greater things ahead that are within our reach, if only we’ll take the risk. At church this morning, I was reminded by Adam Bradley that this principle applies not only to the physical realm, but also the spiritual – where stepping out in faith often involves elements of risk and challenges – challenges that are surmountable. Adam said that he’d learnt that faith is spelt R.I.S.K. Like most risks, there’s often a great sense of achievement and satisfaction in knowing that you gave something your all – and that is was absolutely worth it in the end. How awesome that God wants us to exercise faith and take some risks! I’m sitting on the balcony wearing a sleeveless summery top and denim shorts. The hills, palm trees and sailing boats contribute to the delightful scenery from our holiday apartment. I watch people as they stroll along the promenade beside the beach and it’s amazing to observe who are the tourists and who are the locals. 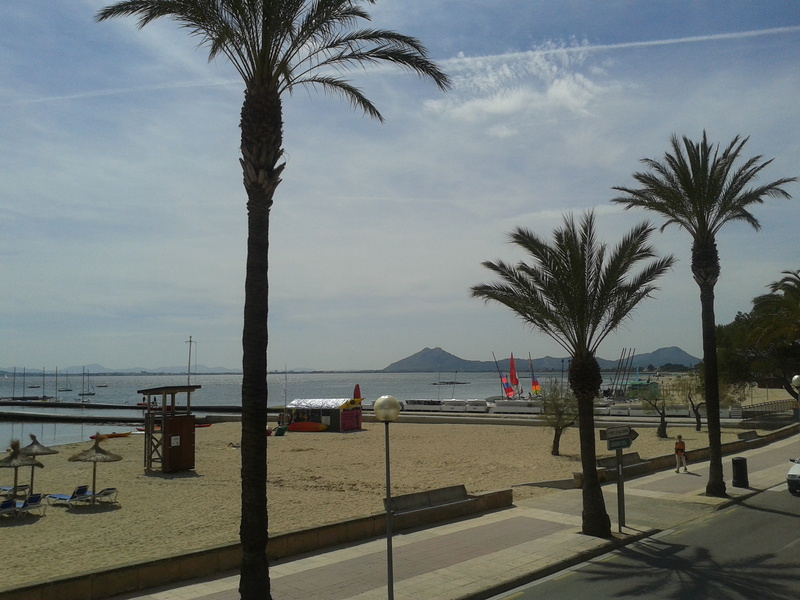 It’s April in Majorca – a stark change from the wet and cold conditions still dominating the British Isles. It’s warm and sunny, but only the start of spring on this holiday resort. There’s a woman crossing the road wearing a coat and winter scarf. It’s inching towards 20 degrees and I chuckle to myself. She’s obviously Spanish; she won’t be ditching the coat till it’s a couple of degrees warmer. The Brits are easy to spot; they’re wearing very little. Starved of sunshine and warmth after a brutally cold, long winter, they’re quick to strip off the layers and soak in the sunshine. Having left behind temps barely hitting 5 degrees for so long, 20 degrees feels blissfully hot. So why the difference in attire? Most will recognise immediately that it’s all a question of acclimatisation. 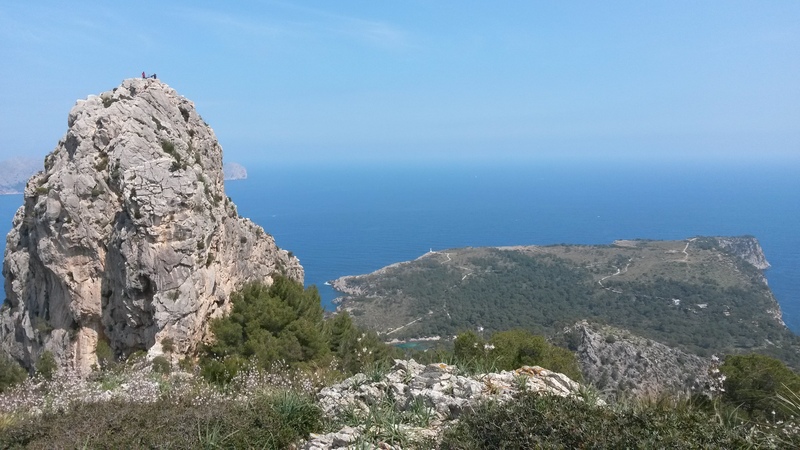 The Spanish are used to the Majorcan sun – it’s nothing special or unusual to them. They don’t feel a desperate need to catch a bit of a tan; they know they’ll be plenty more sun on its way. The thermometer will likely reach 35 or 40 in a few weeks and, for now, 20 is just pleasant, if not still slightly cool to them. Admittedly, even we have felt rather cold indoors in the evenings since we arrived. This got me thinking about my faith – whether I’ve grown accustomed to the spiritual climate around me, such that I’m happy to walk around burdened by layers of stuff, rather than appreciate the newness of each day’s sunshine. Could I possibly be looking for opportunities to strip off some unnecessary layers such as legalism or spiritual striving, and simply enjoy basking in the presence of the Son? Or will I continue to take His presence for granted some days, knowing that He always promises to walk beside me? Perhaps I’m so settled in my spiritual climate that I don’t even notice that things have changed? Has my love for God grown cold or predictable? Maybe I need to shed my coat of mediocrity and my scarf of smug satisfaction and revel in the warm glow of Christ’s grace once again, stripped of the cumbersome layers of obligations and concerns. I’m often so busy trying to achieve in my Christian walk that I neglect the simplicity of enjoying Christ and relaxing in his presence. Just as the Spanish might take the sun for granted, it’s so easy to start taking the Son’s presence for granted. Whilst I hope that’s not true for me, I’m aware that I often don’t really make the most of revelling and delighting in him daily. I’ll never know when I may next be led to walk through a valley or dark shadow. Life has shown me those dark days will come. I should brim over with the goodness and spiritual warmth he pours out on me today. What a wonder to experience his light and tangible warmth! God is good.